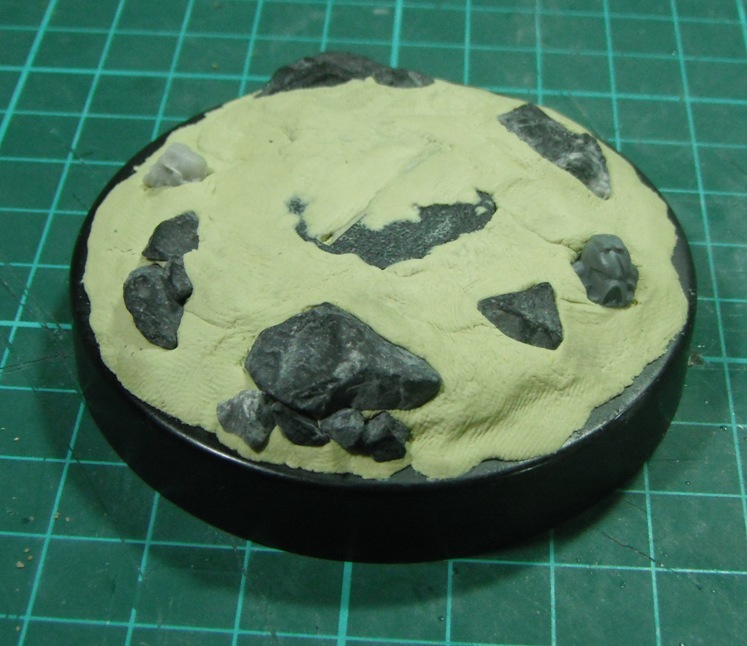 When creating a base for a display model it is often a good idea to go beyond just using the regular base the model is provided with and produce something a bit different in order to set the scene and really make the model stand out. Because this model is for display only and not for gaming the normal limitations of what is practical for can be discarded allowing you to really go to town. The silver lid on the left is an Illy coffee tin lid which is quite large and has a nice raised area on top. This would be ideal for a small group of models or a larger figure such as a dreadnought. 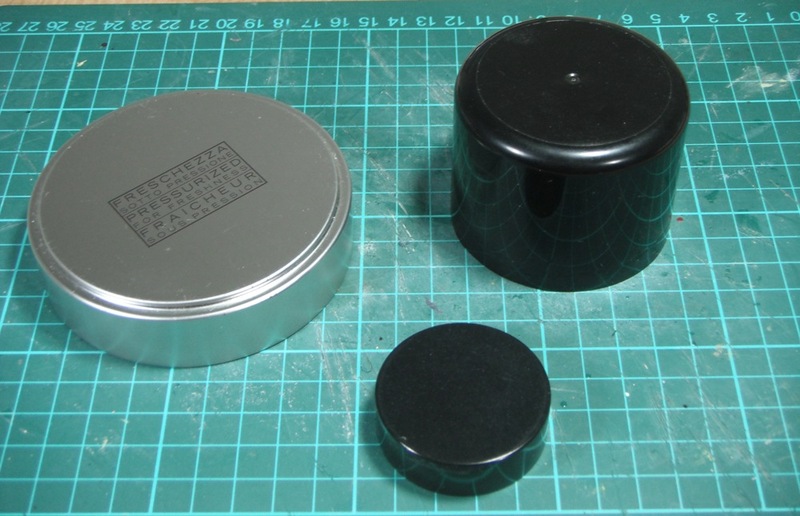 The one on the right is a GW spray paint lid (although the plastic on this might not be rigid enough) and the smaller one is a M&S spice jar lid (perfect for basing 28mm miniatures). The lid I used for my Bad Moon ork nob was from a brand of makeup (my wife’s, not mine, even in my goth days I didn’t dare wear makeup). 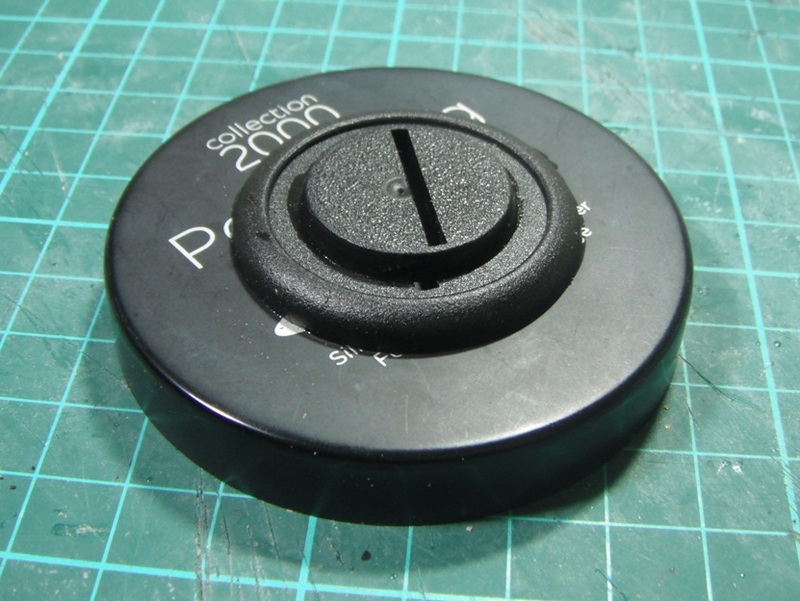 Unfortunately my wife tells me that this line has been discontinued which is a shame as the lids are perfect for bases. I then added height by gluing two wargames bases on top (a 40mm one and a 25mm one). I find it is better to add height using bases or layers of plasticard as this means that you get a nice flat surface on top. 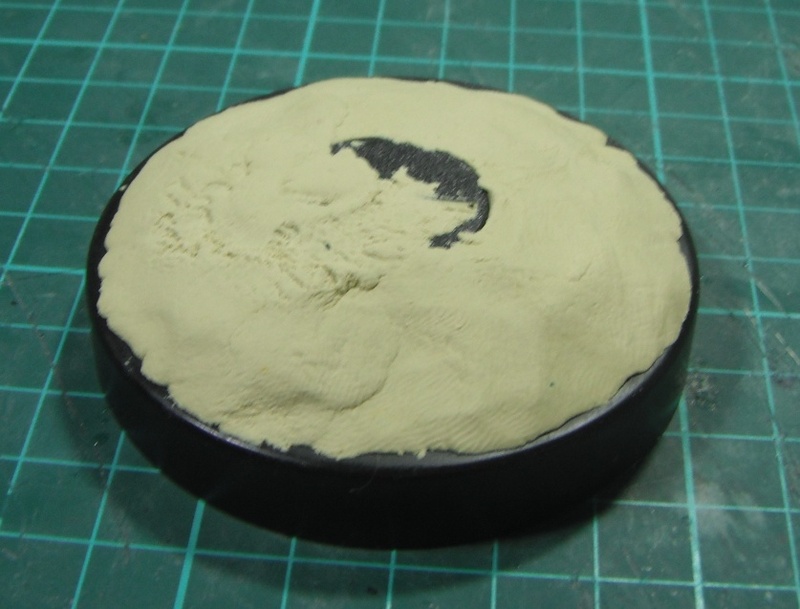 If you build up the base with putty straight away then it can be difficult to get a level finish and your miniature will end up leaning to one side. The base was then covered with milliput in order to create the basic shape of the landscape. 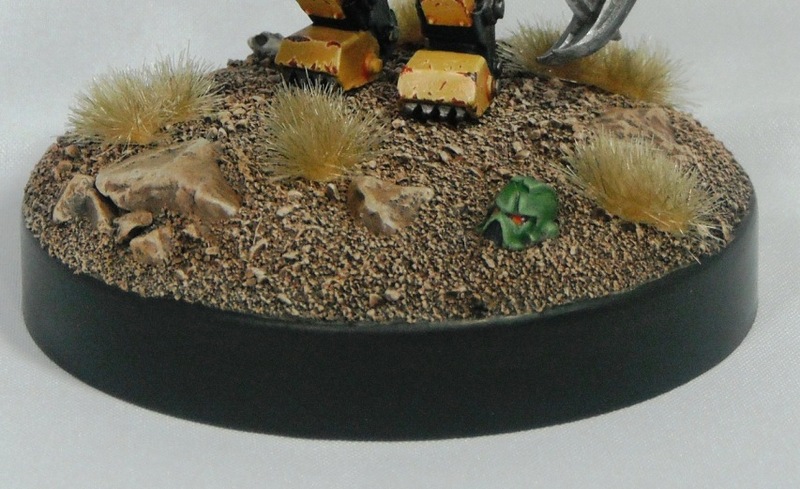 After this detail was added in the form of some small stones, a space marine helmet (taken from the Chaos Space Marine sprue) and a resin orc skull (from the Warhammer Basing Kit) in order to break up the large flat surface of the base and add a bit of visual interest. These were simply pressed into the milliput while wet. Once the milliput had dried completely, the base was finished off with sand and then painted. I don’t have any pictures of this stage but I imagine you have all seen sanded bases before. My only advice here would be to glue the sand on with PVA glue and let it dry. Once dry I recommend painting over the sand with thinned-down PVA glue (about the consistency of skimmed milk). The sand will absorb the glue and it will dry rock-solid. This avoids the frustrating occurance of carefully gluing sand to a base only to have it all fall off again when drybrushing it. 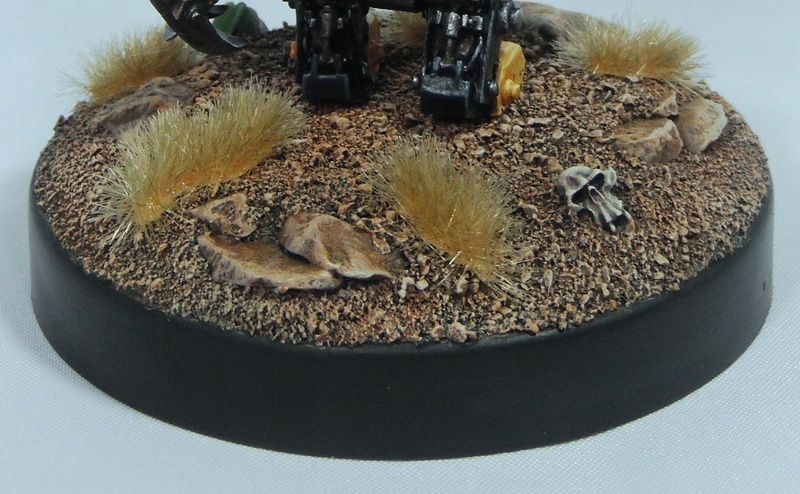 The base was painted with Scorched Brown and drybrushed with the following colours: Bestial Brown, Snakebite Leather, Vomit Brown and finally Bleached Bone. Once the base was painted I added some tufts of grass (in this case Mordheim Turf from GW) in order to add more variety. The full model can be seen here. That’s one quality looking base. Good Job.